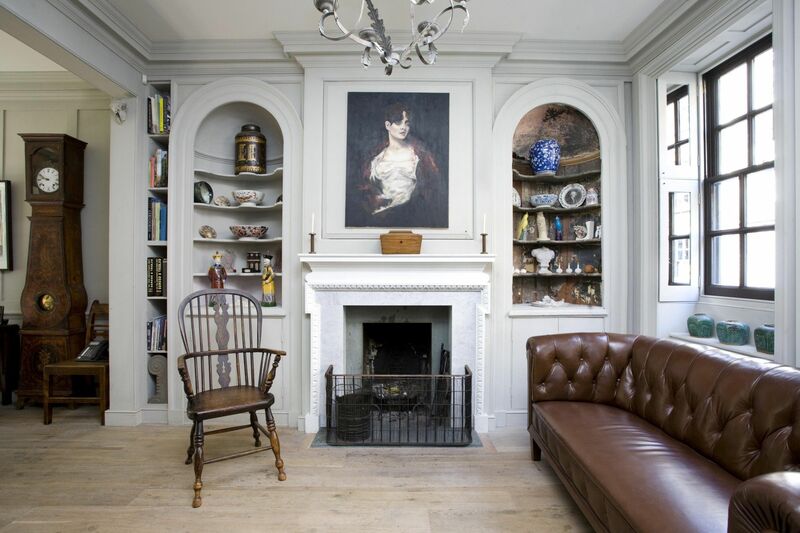 English style in interior design is a harmonious blend of Georgian and Victorian stylistic directions. Georgian style gravitates to the canons of antiquity, with its clarity of lines and symmetry of space organization. The color palette of this design trend is also conservative and reserved. Almost all surfaces are in light, neutral shades. In its turn, the Victorianco trend of interior design is more liberated in color, and in the way of the interior furnishing. For production of furniture are used noble breeds of wood only. In the colors of textiles and wall decoration often present floral motifs and the heirlooms and collectibles often act as decorative elements. We offer you a design project of a contemporary English style house interior with almost all classic inherent features. The traditional living in the style of Albion is incomplete without a fireplace or its simulation. Being the focal point of the room, a fireplace adds symmetry and organization to the living room. Snow-white colors in the decoration of walls, ceiling and central element are in perfect harmony with light wood flooring and neutral colors upholstery. Only dark color lamps and picture frames stands in contrast to this bright living room. An interesting design technique is the implementation of wall cabinets as if them hovering in the air. Finish flooring material matches built-in furniture. It is frequent method for the English interior. 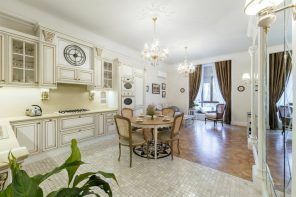 In addition to the living room, there is a spacious open plan kitchen with dining area on the first floor of the mansion. The room is literally bathed in natural light thanks to large windows and glass doors from floor to ceiling. Shades of white working kitchen area shaded by a silvery sheen of instruments and accessories. The presence of wooden elements in flooring and in the dining area gives special warm-heartedness to the room. The ergonomic layout of the working and dining surfaces saves time on routine kitchen work. Even the most unloved work is more enjoyable to perform in a comfortable and friendly environment. Convenient kitchen island with integrated sink allows you to wash the dishes taken from the dining area, and, having dried them, place into the bottom of the integrated cabinets and drawers. One of the walls of the kitchen is fully equipped with a system of built-in cabinets, which allows not only to locate all the dishes and cutlery, but also successfully disguise the appliances. Exit to the backyard is framed by small columns with brickwork, which shades are perfectly match the color of the wood on the floor. Walking up the snowy stairs, we get to the second floor, where the living rooms are. 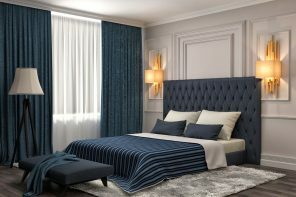 Design of one of the bedrooms, located on the upper level, is simple and concise. Bright and neutral colors in interior decoration are only slightly diluted by bright spots of textiles and decorative elements. The bedroom is equipped with a bathroom in white and gray tones. 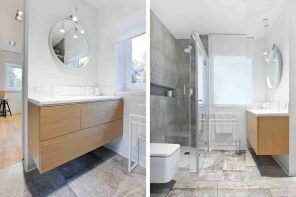 Laconic combination of snow-white plaster and a variety of gray shades in stone finish are reflecting in a glitter of mirrors and plumbing accessories. 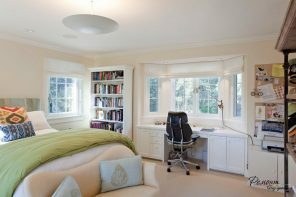 The second bedroom is located in a room with sloping ceiling, which did not prevent arranging of the spacious and comfortable room to sleep. Successful design course was the location of the bed in a wooden alcove with built-in mirror and lights. 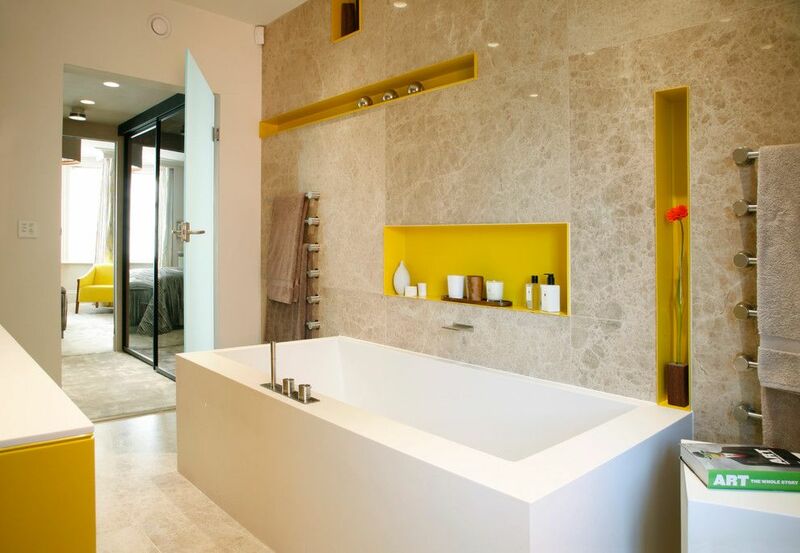 In the white walls of the room are hidden built-in storage, freeing all the bedroom space from excessive interior. 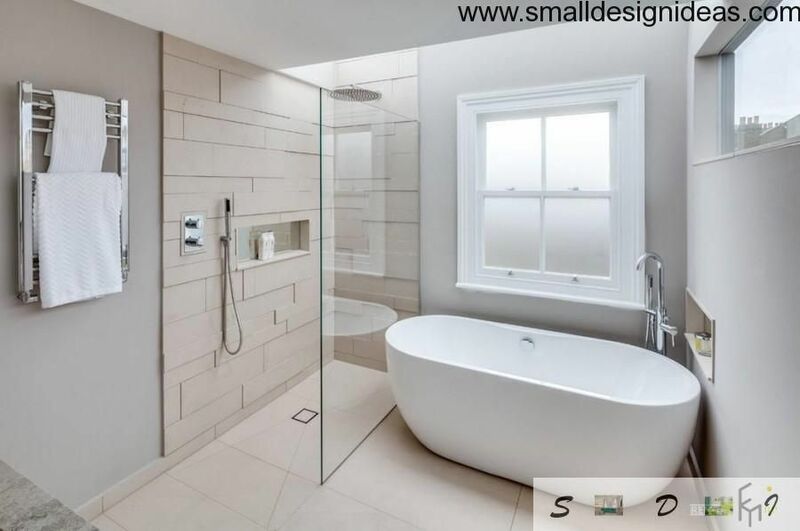 In this more spacious bathroom, in addition to the bath of interesting form, it was possible to locate the showers too. 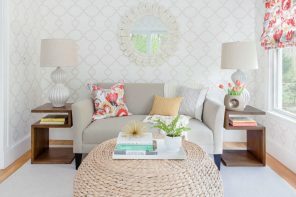 Light room decorated with neutral colors symbolizes the “nothing spare” principle.